It sounds like an early experiment in radical socialism, and it probably was. And many have speculated that it disappeared off the Christian radar fairly quickly because it didn’t actually work very well for very long. But who knows? 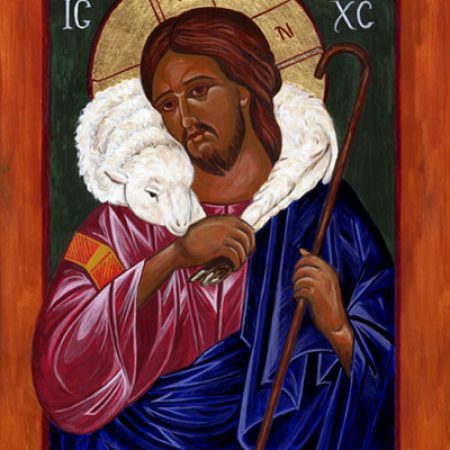 I’m not wanting to try to make a case for or against recovery of this radical sharing practice tonight, but I do want to think a little bit about what our aversion to the idea might mean, and as I’ve pondered that, I’ve noticed a link with the image of the good shepherd that is developed in our other readings. The image of the shepherd developed in the Bible is very different from an outback Australian sheep drover using a motorbike and barking dogs to drive a mob of sheep where he wants them to go. This is partly because the varieties of sheep most common in the Middle East are a more intelligent beast, closer to goats than to the sheep we are used to here. But even more importantly, the flocks were smaller and there was a much more personal relationship between the sheep and the shepherd. The sheep didn’t need to be driven; they would happily follow a shepherd around, because they had learned to trust him and they knew that their safety and their access to the best pasture depended on sticking with him. The image is actually closer to what we see in Australia with dairy cows who will follow a farmer around and respond to his voice. And so it is out of such a close trusting relationship that the writer of the twenty third psalm develops the familiar imagery of being led beside cool waters and lying down in green pastures, and Jesus develops his image of the good shepherd who calls his sheep by name and they know his voice and follow him. But in the words we heard from Jesus tonight, he begins to develop the ideas further. Get that. “Whoever enters by me will come in and go out and find pasture. I came that they may have life, and have it abundantly.” It actually seems to be an image of greater freedom, and he is contrasting it with the thieves and bandits who come to steal and misuse the sheep. Those who stick to Jesus will not only be safe when they are in the sheepfold, but they will come in and go out and find pasture. Jesus is not limiting their freedom. He is becoming a reference point for their freedom. It is through him that they have the fullest available freedom. Those who look for some other way that doesn’t involve regularly connecting with Jesus are the ones who are at risk of sabotaging their freedom and finding themselves lost, stolen, hungry, or otherwise in danger. Those who take Jesus as their reference point, their way in and out, are free to come and go and are assured of finding the good pasture, the places of abundance, the places where all their needs are abundantly provided for. Now, what has any of that got to do with the radical sharing described in the Acts of the Apostles? Well, abundance, and the ability to trust in that abundance, are the main things that make such radical sharing possible. It is when we are anxious that resources might be scarce that we get possessive and begin to jealously guard our own stash. As long as we think that everything is in limited supply, it is the quick and the dead and we have to look after our own interests. We have to make sure that everything is always available to us, and that means making sure others can’t get their hands on it. It’s mine, and I don’t know when I might suddenly need it, so no, it is not available to you. This extends far beyond material possessions too. We can get jealous and acquisitive about all manner of things, because our whole culture is built on a mindset of scarcity and possessiveness. So I can get jealous of another persons gifts or abilities because there is this strange lie in my head that says that such gifts and abilities are in short supply and we have to compete for them. Their possession of them means that my chances of having any worthwhile gifts or abilities are compromised and diminished. I can get jealous of the high regard that another person is held in in the community because the same lie in my head says that reputation and esteem are in short supply and the only way I can rise in the estimation of those around me is at the expense of someone else. They must get less if I am to get any more. And so jealousies and rivalries and resentments fester, and any possibility of embracing a lifestyle of generous sharing is dismissed as threatening and impossible. As long as we are seeing everyone else as rivals, we are not even able to be truly gracious to them, let alone offer ourselves freely and generously to them. Jesus is telling us that this mindset of scarcity is actually based on a lie. Jesus promises abundance. “I came that they may have life, and have it abundantly.” We do not need to compete with one another for resources or possessions or attention or love or giftedness or reputation or acceptance. The economy of God is not an economy of scarcity, but of abundance; overflowing, recklessly generous, above and beyond what anyone could ever need, abundance. There is nothing you really need that is in limited supply. Love, grace, freedom, acceptance, hospitality, mercy, understanding, humour, peace. Nobody else’s possession of these things threatens or limits your access to them. God pours them out in rich profusion, in outrageous abundance. If they seem scarce or limited to us, it is not because they are, but because we are so conditioned to believing that everything is measured out in meagre handfuls that we have to fight and scrap for, that we have fallen for a lie. They say that if you stand a cow in a paddock where it can’t see the fences, it will imagine them to be very close and complain about its lack of freedom. But it is a lie. “I am the gate for the sheep. Whoever enters by me will be saved, and will come in and go out and find pasture. I came that they may have life, and have it abundantly.” If we can trust Jesus, and trust the abundance he came to bring us, then we will be set free from the resentments and rivalries and jealousies and possessiveness that climb over the walls and bind us and enslave us and rob us of all joy and community and love. In a few minutes we will come to this table, the table of our Lord, the good shepherd. The fare on this table will not look abundant to the naked eye. Little shots of wine and one little loaf of bread to be divided between us. But this is the table of the same Lord who fed a crowd of thousands with a few small loaves and a couple of fish, and there were basketfuls of leftovers. But the abundance of that feast was not seen in what was laid on the table at the start. The abundance only emerged in the sharing, in the giving away. Attempt to cling to it and own it and guard it, and it will crumble away in your hands. But in giving it away, in sharing it recklessly and heedlessly, the abundance is seen and enjoyed and shard around. “All who believed were together and had all things in common; they would sell their possessions and goods and distribute the proceeds to all, as any had need.” God is extravagantly gracious. Open your hands. Let go of the scraps you have been clinging to, and receive all the abundance of life that God longs to pour into your hands.